Transpire is delighted to be acknowledged by both the Deloitte Technology Fast 50 2018 and the CRN Fast50 2018 for its recent rapid growth. In the Deloitte Technology Fast 50, Transpire placed 44th based on 113% revenue growth over the last three years (2016-2018). In the CRN Fast50, Transpire’s 72.62% year-on-year growth secured 27th position. CEO Luke Smorgon alongside Founder and Director of Innovation Josh Guest at the Deloitte Technology Fast 50 2018. 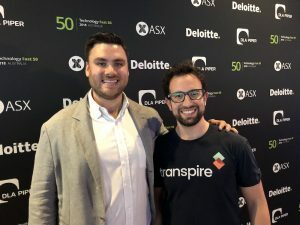 “I’m so proud of our team for helping Transpire grow into such an impressive and impactful business,” said Transpire CEO Luke Smorgon. Both industry accolades quickly follow Transpire’s 45th position in the Australian Financial Review Fast 100. Transpire’s human-centred design approach to developing digital products has helped customers including Virgin Australia, Vodafone Foundation, AGL, ANZ, the Australian Government Department of Veterans’ Affairs, Telstra, and many more. By delivering innovative and engaging solutions, Transpire continues to empower its customers and facilitate exceptional user experiences across mobile, web, and emerging technologies. The 2018 Deloitte Technology Fast 50 Australia Awards rank Australia’s fastest growing public or private technology companies. “More than ever, this year showcases world leading Australian business innovation and it is a tremendous achievement for any company to be named among the Deloitte Technology Fast 50,” Technology Fast 50 Lead Partner, Josh Tanchel said. Now in its tenth year, the CRN Fast50 recognises the fastest-growing companies in the Australian IT channel. 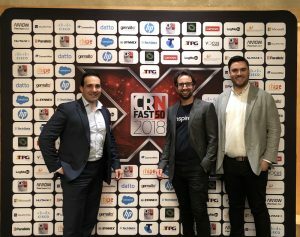 By adhering to a strictly numbers-based formula, the CRN Fast50 continues to earn respect and recognition as the only awards program in the Australian technology industry that truly recognises the best businesses based on hard facts.